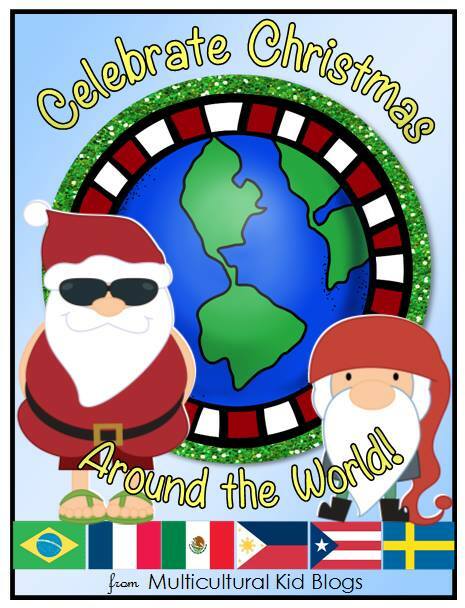 When Multicultural Kids Blog announced their Celebrate Christmas Around the World Packet I couldn’t help to feel overjoyed! As a homeschool mamá that also babysits 2 little girls ages 4 and 5 I was excited to get my hands on this packet! This packet is geared for grade levels ranging from PreK, Kindergarten, 1st grade, up to 2nd grade. Hence, a resource I can use will all three children. With Christmas literally right around the corner, this packet could not have come at a better time! As I looked over the packet I was excited to see of course, Puerto Rico (si, si, I am bit biased in that regards hahaha! ), Brazil, France, Mexico, the Philippines, and Sweden are included as well. Through my mind I thought of the endless possibilities for extension activities to use with this packet. However, for purposes of this review I’m going to focus on the packet itself. It’s full of activities, recipes, games, and more! You really don’t need anything else besides the packet to teach your children or students on how Christmas is celebrated around the world. In the packet you can give them a glimpse to the longest Christmas in the Philippines, to learning about Le Réveillon in France, or Las Posadas in Mexico. For each country you will find interesting country facts, coloring pages, and a Christmas activity and recipe. The activities, and recipes are easy for the children to follow with some help from an adult. This packet is not only informational, it’s also a cultural resource for six different countries! On the packet I couldn’t find information on the duration. But, upon reviewing it, and with so much information, and hands-on activities I estimate that it will take 2 weeks if you were using the packet daily. Nevertheless, I’m planning on working on two countries per week to be completed before Christmas on December 25th. Most likely I will be sharing Instagram pictures of our activities. So make sure you’re following me Instagram. If you’re searching for a complete cultural resource to teach your children/students on how Christmas is celebrated around the world I highly recommend this packet! You can get it here.